In previous two posts, I explored couple of angles on the famous Trust thingy that, allegedly, Greece so massively lacks. But, of course, my comparatives related to the 'peripheral' euro states, mostly Ireland. You can use the same two charts to draw conclusions on comparing Greek performance to other states, but the question still remains: outside the 'periphery' just how much Trust currency is there in circulation in the EU? Take countries that are not in the group of borrowers from the IMF. There should be plenty of Trust to go around amongst them and the EU. And this means there should be plenty of agreement between their policies and the policies suggested to them by the Commission, especially those aimed at addressing that major burner of Trust - failure to comply with core fiscal criteria. We can take a snapshot of this 'metric' of Trust by looking at how severely do EU member states deviate in their policies from the Commission prescriptions. This 'metric', after all, is an exact replica of the arguments advanced in the Eurogroup in the context of accusing Greece of wasting EU's trust. 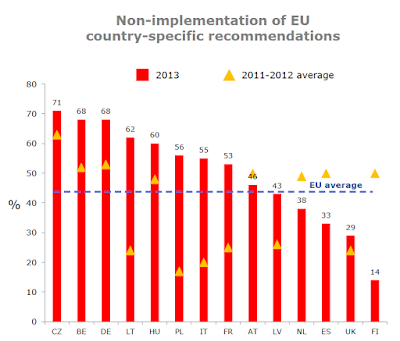 What the above shows is that back in 2013 all of the EU states who were issued with 'country-specific recommendations' concerning their poor fiscal performance opted to ignore these recommendations. That is some Trust, there. 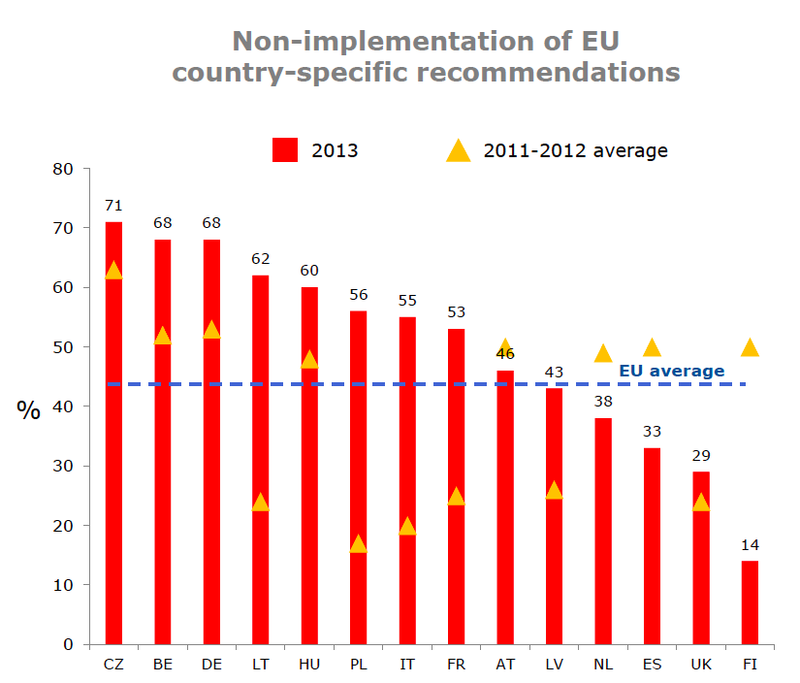 Between 2011-2012 and 2013 the extent of non-compliance did not decline (despite all the talk about austerity and structural reforms), but rose both on average and specifically in 10 out of 14 countries covered by these recommendations. That's some more Trust, right there. On average, in 2013, some 43% of all EU Commission recommendations were not implemented by the states that are so distinctly Trustworthy from Greece, that Greece was singled out as a special case by the Eurogroup and the Euro Council. Some of the worst offenders was Germany, and its pal (in berating Greece) Lithuania, plus the usual suspects of Italy and France. Now, I am not a fan of EU Commission recommendations. But the fact is: Greece is by far not unique in terms of 'reforms' fatigue or lack of engagement with the EU Commission proposals on fiscal adjustments.